"When you look at art, you may see and feel things differently than your neighbors or friends or classmates. You might focus on a work as a whole, or you might zero in on a small detail that jumps out-- a patch of sky, a sailboat, even a swirl of color. Looking at a work of art can produce a range of emotions and reactions. It can make you happy or sad; make you laugh, think, ponder, or wonder. 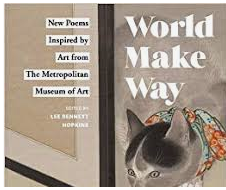 World Make Way features 18 poems especially commissioned for this book, written by contemporary poets. Reaching deep within their hearts and souls, each poet interprets what they unearthed after viewing a specific artwork. The arts and their artwork stem from many parts of the world, were created at different times in history, and depict a wide variety of subjects. A wide range of mediums-- such as oil paint, pencil, and ink-- were used as well. The pictures capture your eye, just as the poems capture your ear. And that pretty much sums up this book. Eighteen terrific poets (including several who are regulars on Poetry Friday)- Alma Flor Ada, Cynthia Cotten, Rebecca Kai Dotlich, Julie Fogliano, Charles Ghigna, Joan Bransfield Graham, Lee Bennett Hopkins, Irene Lathan, J. Patrick Lewis, Elaine Magliaro, Guadalupe Garcia McCall, Marilyn Nelson, Naomi Shihab Nye, Ann Whitford Paul, Marilyn Singer, Carole Boston Weatherford, and Janet Wong-- each wrote a poem in response to artwork from the Metropolitan Museum of Art. 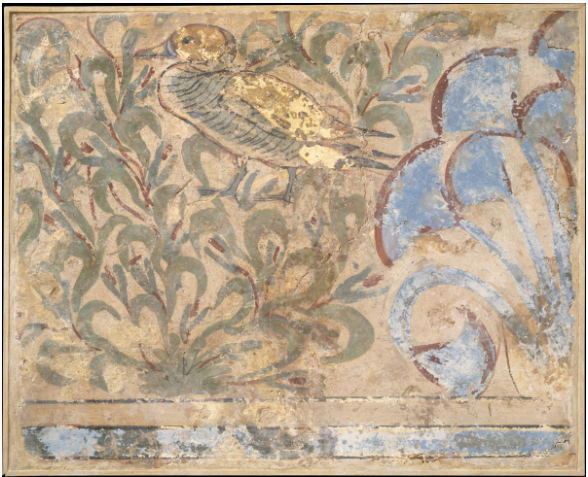 The oldest piece, I think, is an image of a duck, painted over 3,000 years ago for "a decorative floor in the palace of Egyptian king Amenhotep III." with a poem written by today's Poetry Friday host, Irene Latham. 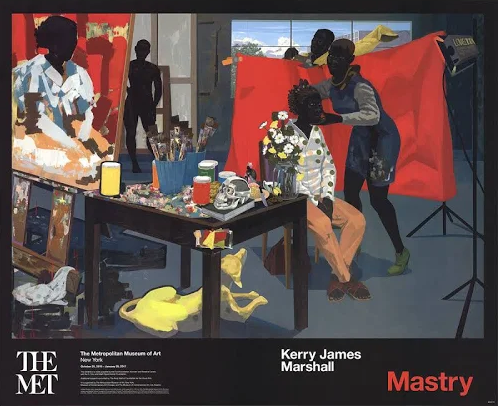 The newest piece of art was painted by Kerry James Marshall in 2014; Marilyn Nelson wrote the poem for that piece. Each two-page spread includes the artwork and the poem. End matter includes information about the poets and also about the artists. Every cell of their body says Make Art. How complex light is on black skin. no matter who youare, you can make art. Irene Latham, at Live Your Poem, is hosting today's Poetry Friday. I find ekphrastic poetry such a challenge. I'm always worried that I might interpret the art wrongly, or that my response might not do it justice... Lee Bennett Hopkins' foreword really spoke to me. Sounds like a beautiful collection. it restores our courage, revives our faith." It is a beautiful book to savor, and to learn from! Thanks for reminding me of this book. Time to get it out again! Hope you had a nice Thanksgiving, Carol! Thank you! I can't wait to hold this book in my hands. It looks so lovely. I love this collection. Poetry begets more poetry with books like these. Makes me want to go write another poem. Thanks for reminding me of the power this book holds. I love ekphrastic poetry. This looks like a beautiful collection. Gorgeous alliteration in Irene's poem -- it made me feel the birds swimming along the river. I was worried at first when Lee sent me the image of the painting that I had to write my poem about. I had expected it to be an impressionistic work of art. Instead, I got a painting of a Chinese emperor's horse/charger done circa 750! I really feared I'd never get the inspiration to write a poem about Night-Shining White. Then I read the museum's description of the painting of the horse "With its burning eye, flaring nostrils, and dancing hoofs, the fiery-tempered horse epitomizes Chinese myths about Central Asian "celestial steeds" that "sweated blood" and were actually dragons in disguise." I did a little more research and got my inspiration--and the words started to flow as I wrote a mask poem in which I spoke in the voice of the horse. Lee asked for just a few minor changes to the first draft that I sent him. What a relief! It's a beautiful book, and those are two gorgeous selections. What an amazing collection. I loved Irene’s poem. Such a rich collection of poems and art in this book–it's become a favorite of mine. Thanks for sharing it and the two moving poems also–they both transport us to another place.